Fast-paced and fast-mouthed, here's snappy, scrappy big-city journalism at its best! Editor Steve Wilson and ace reporter Lorelei Kilbourne bring the news to life at the Illustrated Press. 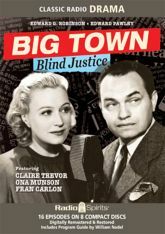 Edward G. Robinson, Ona Munson, Claire Trevor, Ed Pawley, and Fran Carlon star in Big Town! Their cosmopolitan co-stars include Paula Winslowe, Lou Merrill, Joe Kearns, Gale Gordon, Verna Felton, Hanley Stafford, and Hans Conreid, with a special guest appearance by famed silent film star Evelyn Brent. Includes rare episodes, and a Program Guide by William Nadel.